Actors often got roasted on Dean Martin specials in the seventies, but Warners did it for real in 1932-33 with Doctor X and Mystery Of The Wax Museum. Two-color Technicolor was another name for Hell on sets topping 120 degrees, but who could say no to a day’s wage in those deprived days, even in working conditions horrible as this? Color ups the weirdness quotient in two horror films that would be outstanding without it. Wax Museums are all the more mysterious when viewed in limited spectrums and attempts at hues beyond the capacity of Technicolor still in its infancy. I could enjoy this process all day if only enough of it survived to last that long. As it is, almost every negative was junked years ago, and the few surviving are difficult at the least to see. 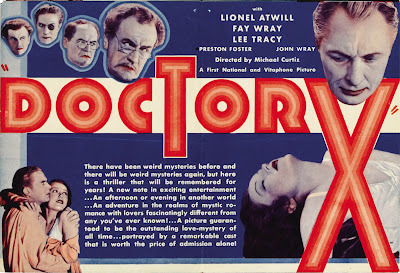 Doctor X and Mystery Of The Wax Museum are unique for being the only horror films shot in any kind of Technicolor during the thirties. The two-color process was never satisfactory for cartoons, and musicals suffered from pallid representation of costumes and décor, but horror films stood to reap enormous benefits from not of this earth color seemingly shot through lens smeared with formaldehyde. 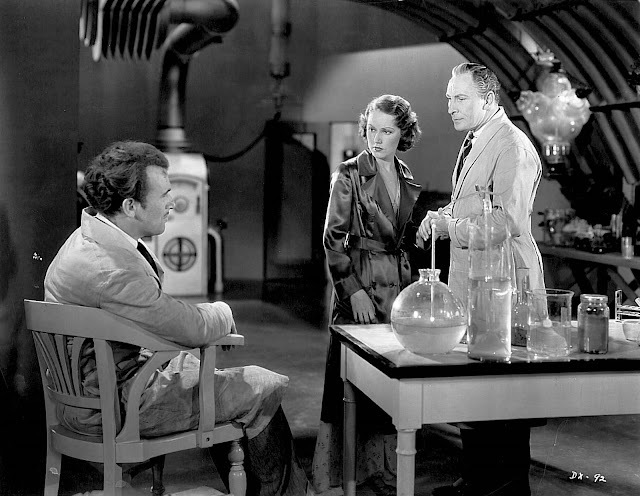 I don’t know how that Doctor X crew stood workdays running to twenty hours under the martinet direction of Michael "Skip Lunch" Curtiz (shown here with star Lee Tracy). Unions in 1932 were proposed, if at all, in secret meetings among participants who knew not the meaning of days off. On Sabbaths while most rested, the Doctor X team worked straight through Saturday night and into early morning hours, so that when they did finally arrive home, sheer exhaustion negated Sunday recreation other than blessed sleep. For those in the camera’s glare, lights needed to enable Technicolor were intense beyond endurance and some players sustained damage to eyes they’d keep for life. The mad dash to completion was Curtiz’s idea as he was forever bent on impressing front office monitors judging him by the clock. If Doctor X called for twenty-four days shooting, he’d push hardest to do it in less, telling starved minions to fill empty stomachs with aspirin even as he arrived fresh after steak and egg breakfasts figured to last the day. 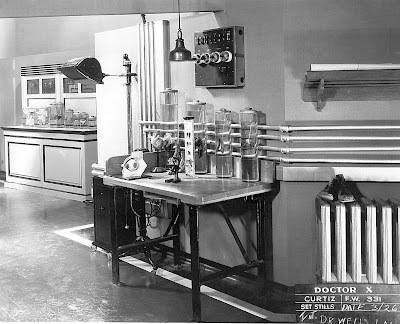 Much as I’d like to have been there in 1932 to watch them make Doctor X, a safe distance might have been preferred lest they put me to work (and I’m just craven enough to insist on at least one meal during my twenty-hour workday). It's easy to minimize star complaints over abuses of the factory system until you read accounts of Doctor X and similar harassed productions. Walk in those not to be envied celebrity shoes long enough and you’d have surely felt the holes in them. College friend Dan Mercer lived in an attic apartment during part of the time we attended Lenoir Rhyne. It was an old house downtown, and the place looked for all the world like Laird Cregar’s upstairs hovel in The Lodger. I think Dan even had a hot plate, though I’m not aware of his having used it for medical experimentation. One night in 1974, he entertained some of us with an 8mm reel of highlights from Doctor X. It was eight minutes or so in black-and-white, but what a thrill to see any footage from that elusive classic. My previous exposure to Doctor X had been on Channel 8’s Shock Theatre back in the sixties. I’d read in Famous Monsters of its having been made in color, but would never have imagined we’d see it that way on television. Years later, I learned of syndication’s Doctor X being a legitimate black-and-white version shot in addition to the color one we know today. 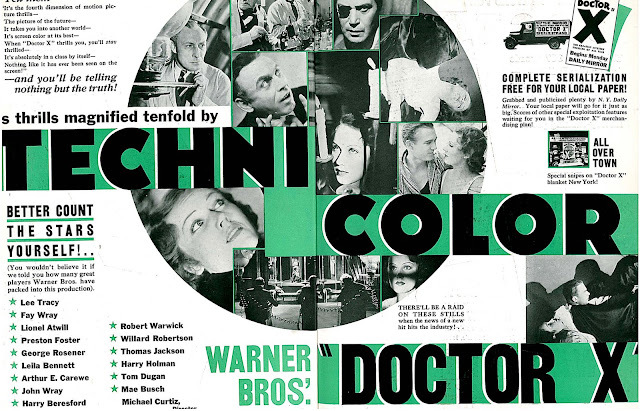 A curious kind of reversal has placed the color Doctor X at easy access, while the black-and-white alternate, with different takes and varied camera placements, has retreated back into sealed vaults and is nearly impossible to see outside of gray marketed DVD. Technicolor in the early thirties got a black eye from too many badly registered prints getting out of understaffed labs and limits built into the system denying truly lifelike reproduction of multi-hues. People were said to be sick and tired of it by 1932. Warners was stuck in an ironclad pledge to make features using the process and chose the two horrors to blow taps on Technicolor until improved three-strip cameras turned again on a few of their short subjects two years later. I actually think Doctor X looks better in that limited process than it would have with later cobalt Robin Hood-like trimmings, but then I’m peculiarly sympathetic to funky color schemes unconfined even as they’re hog-tied to red-orange, but never red --- blue-green, but never blue. Reassuring to know that the color of synthetic flesh is one that can never be duplicated, no matter how sophisticated our modern technologies. I always thought it would be neat to live in a home designed by Anton Grot. 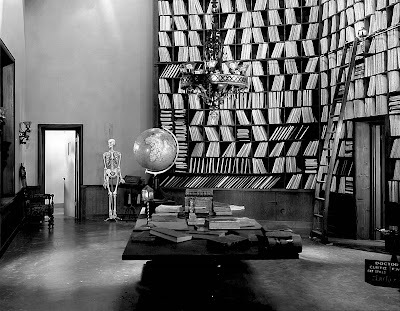 My library would look much like the one shown here for Doctor X (I’d certainly maintain that picturesque skeleton). Separate wings might be given over to imposing archways, pillars, and balustrades, none of them necessarily leading anywhere (as with Doctor X), but all contributing to the sort of old dark dream house some of us might enjoy retiring to. These set reference stills represent Grot minus shadows and lighting effects that enhanced his brilliant work at Warner Bros. They were for use only by the so-called Technical Office (as back stamped), and were never supposed to be published or otherwise disseminated. Many were looted out of file cabinets decades later and sold among memorabilia shops in LA and beyond. Amazing the transformation sets went through once (two-color) cameras applied their magic. Grot had a showman’s sense of dramatizing physical space and making ordinary rooms vibrate with mood and atmosphere. It’s hard imagining how he did so much on limited Warner budgets (Doctor X’s negative cost was $224,000). Grot’s furniture always looked to weigh a ton. I’d hate to have been the propman moving his more than substantial props around. How often do we see art deco tables and chairs in a Grot designed pre-code and wish to heaven for such an object to grace our own living rooms? Thanks to him, WB pictures made cheap never looked that way. He knew the effect his designs had. Interviews were peppered with references to Doctor X sets as a bird of prey about to swoop down on its victim. This art director had a solid understanding of sets as repositories for maximum tension and, as he called it, a sense of impending calamity. Players could sit still and say nothing in worlds Grot created and we’d wait yet for something frightening or fanciful to happen. Men like Grot deserved more credit than most of them got. Historians have said that designer William Cameron Menzies made director Sam Wood look good in pictures like King’s Row and For Whom The Bells Toll. I’d venture that Michael Curtiz owed a good bit of his reputation to Anton Grot’s assist. He acknowledged as much in memos throughout the period they worked together at Warners. 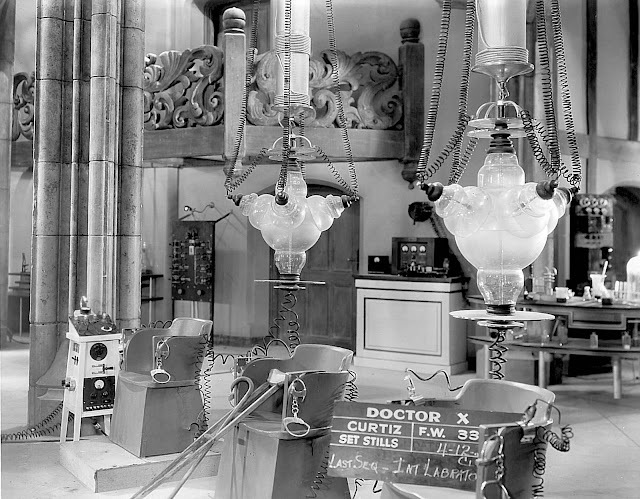 Doctor X is one stairway and secret passage after another to nightmares 30’s audiences surely experienced for having seen it. Latter-day uninitiateds wonder how overripe, seemingly cornball thrillers induced such fear among 1932 patrons. I think a lot of it has to do with backgrounds like Grot’s enhancing tension and closing escape routes audiences might take via weak performances, indifferent stories, or risable dialogue. Maybe they (and we) can laugh at dated theatrics, but there’s no minimizing creepy ambiance still as effective as when Grot designed it (more so considering what a lost art his seems to have become). Restraints applied to story and script during the thirties are non-issues with such visual fear factors built into classic horror films. On sets evocative and creepy as those in Doctor X, even comic relief Lee Tracy finds it hard offsetting moods of dread. Folks remembered longer what they saw than attempts at levity they heard. Random wisecracks weren’t anything like enough to relieve two-color memories of horror scenes played straight. Add synthetic flesh to the mix and it wouldn’t matter if you had Lee Tracy hopping around on a pogo stick. It was mechanics of the former that accompanied patrons to their beds at night, not Tracy’s hand-buzzers and exploding cigars. 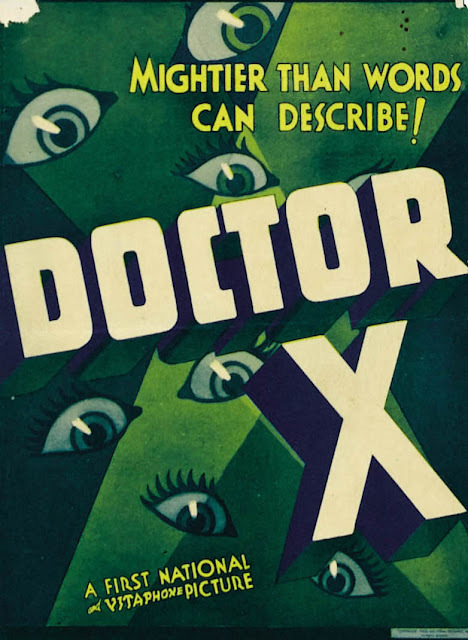 I’m guessing a lot of that comedy designed as relief in early thirties horror films fell well short of the mark where better thrillers such as Doctor X were concerned. Note the wide-eyed exhibitor checking out his recently arrived pressbook for Doctor X. Looks like Warners pressed an anonymous Golddigger into service peddling their uniquely pre-code slant on the currently popular horror cycle. Besides modern settings in lieu of old-world Universal monster surroundings, both Doctor X and Mystery Of The Wax Museum emphasized their women bound and vulnerable to assault by all too human fiends. Sexual dimensions implied by Fay Wray lying prostrate before the Moon Killer was the stuff of exploitation dreams. The theatre front shown here was Charlotte’s Broadway Theatre. 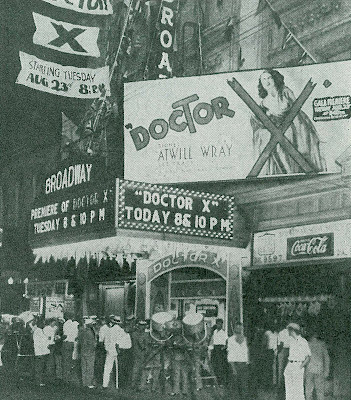 Searchlights out front and a twenty-four sheet trumpeted the Southern Premiere, and sure enough August 23, 1932 was only weeks after New York’s Strand opened Doctor X on August 3 (the Broadway's front display for another 1932 horror release, The Mummy, can be seen here). The Broadway was one of three ornate first run movie theaters in downtown Charlotte, though it seated only 750. It had been first to bring Vitaphone there, starting with Don Juan in January 1927 (earlier than I might have expected for any NC house). Doctor X would go on to earn $405,000 in domestic rentals, with $189,000 additional foreign receipts. A final profit of $72,000 was especially rewarding during an otherwise hard year in which a number of Warner releases lost money. The panic was on among film companies, as most were facing real possibilities of bankruptcy. The success of Doctor X confirmed the wisdom of Warner’s prior decision to go forward with a follow-up horror, Mystery Of The Wax Museum, to be visited here in forthcoming Part Two. Many thanks to Scott MacQueen for information and advice on this and Part Two to come. Scott's production histories on Doctor X and Mystery Of The Wax Museum in American Cinematographer (June 1986 and April 1990 respectively) are the last word on the subjects and the source of factual data for writers ever since (he also provided an excellent audio commentary for the DVD of Doctor X). 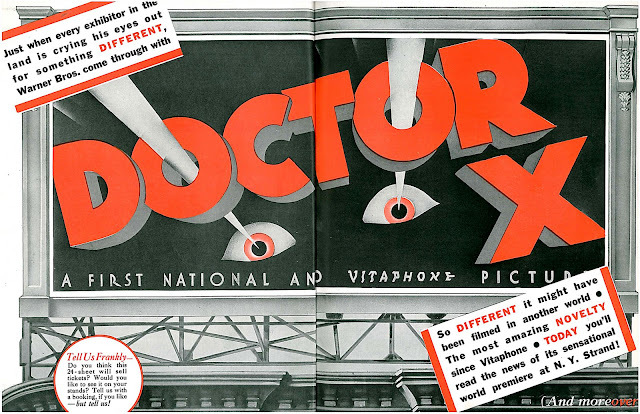 Of the two horror film in Technicolor that Michael Curtiz made, "Doctor X' is by far my favorite. I would almost give anything to be able to watch the black and white version back to back with the Technicolor version. The majority of the people who saw this film in 30s had only access to the black and white version. The Technicolor version was never released in Argentina and I am sure that the big majority of the American audiences were also able to watch the monochromatic version only. Michael Curtiz is a filmmaker it is always going to be one of my favorites. The movie that brought him to America, "The Moon Of Israel" is an unforgettable experience and everybody who cares for him must see. Hello John! This piece was sooo good! Quickly (and briefly) you honest-to-god reminded me of something I had long-forgotten:Dad had an agent for awhile, who was also an attorney at CBS,named Leo Lefcourt. Leo was married to a lady named Sue, who had been a chorus-girl in the earliest days of the talkies. Your piece reminded me of her once telling me about working on one of those early techicolor scenes, in a pic called "Paramount on Parade" -- the scene was the film's big finale, Maurice Chevalier singing "Sweeping the Clouds Away", and Sue told me the lights were so incredibly intense, they could only shoot for a few-minutes at a time, before they had to kill em and break for awhile! I too have fond memories of "Dr. X" playing out here in the L.A. market when I was a kid. Outside of Preston Foster's obsessive line about "syntheic skin" (Oh, that takes me back) I remember what was obviously a very pre-code moment, of Lee Tracy going into a bordello to make a phone call, I think, and being greeted on the stairs by Stan & Ollie's old nemesis, Mae Busch. 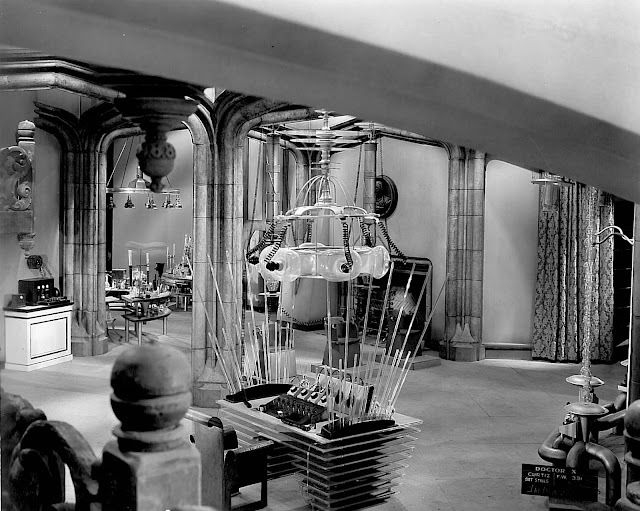 I also agree with you about Anton Grot -- whether it was "Dr.X", or the studio's latest "Goldiggers" picture, his designs were always very evocative and gave the Warners' films as distinctive a look, as Hans Driers' and Cedric Gibbons' did their respective studios'. 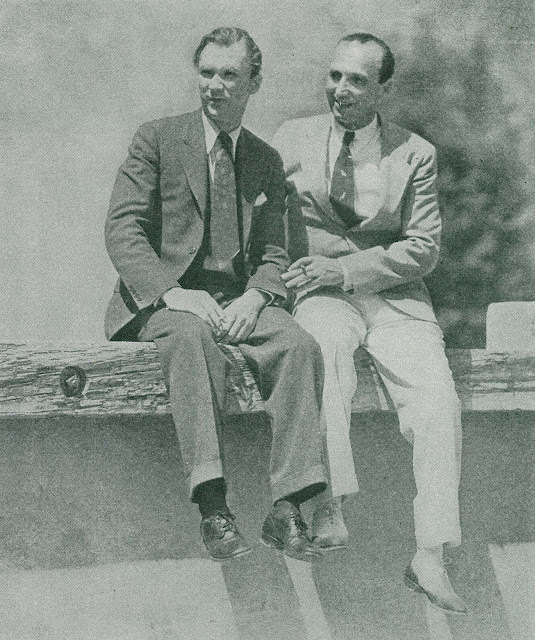 My father always spoke very well of Micheal Curtiz -- apparently Mike and my grandfather were good friends. Dad said one day on the lot, he passed a soundstage where Mike and my grandfather were in deep conversation. Not wishing to disturb them, dad , as he passed by, said "Hi, dad" "Hi Stu" my grandfather returned. At which point, Mike called my father over. "Young man, don't you know you should kiss your father when you see him?" Dad said what could he do? After all, Curtiz! So, he kissed my grandfather on the cheek, thanked Mr. Curtiz and made a hasty exit. Oh, those mad, romantic Hungarians! Did I say this was going to be brief --oy vay! Thanks again, John. R.J.
R.J., that is hands down the most priceless Curtiz anecdote I've ever heard! Radiotelefonia, I've never seen a Curtiz silent from his European period. Are these mostly lost? I wonder if Kino might have an interest in releasing some of the surviving ones, including "The Moon Of Israel". I for one would love to see that! More Curtiz, including behind-the-scenes photos, to come in the "Wax Museum" posting. Great work. Doctor X lives on. I specialize in Hand Tinting Black and White Photos the "Classic way". I use my own 2 Zone Technique to create my Photo Art.Never computer aided in any way. with Color Photos that I am currently converting into Black and White Photo Art. My Photo Art is original and signed. I have been in the field over 26 years. Of the Michael Curtiz European silents three of them are available online, including "The Moon Of Israel". This film was restored by Lobster Films in 1998 and that version is the one online. The print however is in English (Lobster replaced the intertiles) and Curtiz is credited as Courtice. It is impressive the quantity of films online. For silents, I was able to get a Fritz Lang rarity located and restored in Brazil and the Henry King and Richard Barthelmess' "The Seventh Day", although this version is in Czech with no subtitles! Warner HAS released Mystery of the Wax Museum. It shares a DVD with the 1953 remake House of Wax. I picked up the disc not long ago for less than ten dollars.